For its third edition, the International Biennial of Digital Art of Montreal set up at the Arsenal. Initiated by Alain Thibault, who is also the Artistic Director, it again this year brings together a plethora of events prompting us to reconsider an art ‘made by machines’ and / or ‘for machines’ with its theme: Automata. The BIAN began with its satellite events in April, while others will close it next August. An example is the ADC / DAC exhibition from Diagonal Gallery in the Montreal neighbourhood of Mile-End. Its title indicates that it is focused on analogue to digital conversion and vice versa, hence the in between of these two worlds that are so familiar to us now. Phillip David Stearns notably presents the series of tapestries Vestigial Data produced on a digital Jacquard looms. It is interesting to note here that this same machine, originally designed by Joseph Marie Jacquard in 1801, could be controlled using punch cards. Making it one of the ancestors of our computers. As for the pictures that represent the tapestries, they come from recovered files following a crash by the New York artist on his own machine. After processing them through algorithms, he recycles them in the artistic context of a white cube. 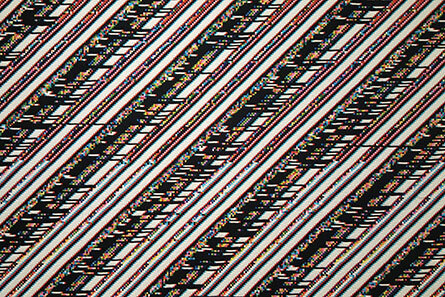 Beyond its glitch aesthetic, the work is the result of the automated passage from one state to another and from machine to machine. The Automata exhibition at the Arsenal, in June 2016, is the main event of this BIAN. In the centre of the largest of the two exhibition halls, there are seven portraits comprised of many thousands of fragments of red, green and blue in anticipation of their inevitable destruction. These are the portraits of those who have made the history of digital, starting with Charles Babbage. Let us recall that in 1834, this latter had the idea of ​​combining the Jacquard loom’s punch cards with a machine ‘to calculate’ which, over time, would become the computer. 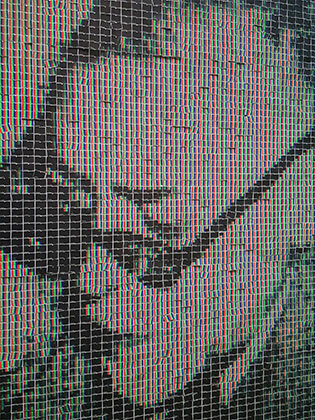 The mosaic images of this series entitled dyforme by Colombian artist Paolo Almario are on paper. Although, in detail, they remind us more of the RGB displays of our screens. So this is, again, the expression of the transition from one state to another. Particularly as the mechanism that was placed behind the portraits meticulously destroys them by ejecting one by one the fragments of images or pixels on the paper. At the end of the exhibition, the floor will be littered with fragments of the portraits of inventors who are driving the digital medium that contemporary art has to rethink throughout its mutations. “ Man at Work”, 2014. 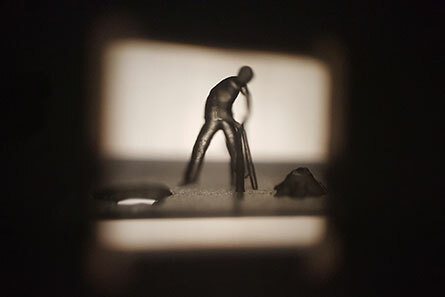 The presentation of works of a digital nature often comes down to questioning the media whose technologies are accelerating change, as is the case with the film installation Man at Work by French artist Julien Maire, who has modelled one by one the key poses of the subject of his film loop: a labourer. 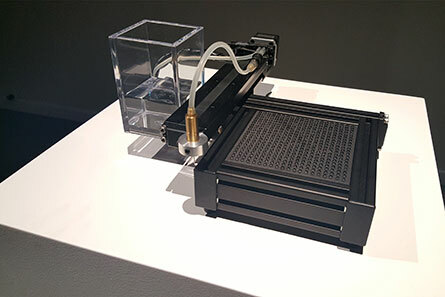 But he has also printed his own three-dimensional models before projecting them through a somewhat low-tech installation. The frame rate of this man at work leads us to that of pre-cinema while the manufacturing process is among the most ‘innovative’. The reflections of this film in relief have nothing to envy to those of the most powerful rendering engines of the visual effects industry. Field depths are of comparable quality to those obtained with professional objectives, because the depth is not simulated but real. There is, in the comings and goings of this virtual actor, the expression of a strangeness stemming from the mix of media or media supports as well as their historical origins, which in no way impairs the unity of style of this resolutely contemporary animation loop. 84 x 50 inches”, 2014. 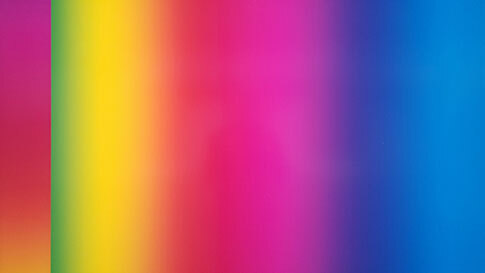 Cory Arcangel, because he is American and has always been inspired by popular culture such as video games, has often been described as a pop artist in the digital era. Although the piece he has at the Arsenal has a lot more in common with abstract painting. It actually belongs to the series of Photoshop Gradient Demonstrations whose extended titles give us the recipes if not the algorithms, but in natural language, which are about Photoshop and its CS version. The titles in this series also contain the width and height of the file as well as the cursor position and the gradient type to use. Thus, we can almost ‘recreate’ the work in question ‘at home’. While on the online sales site Artsy, such prints in C-Print can exceed two hundred thousand dollars. The interest of such a work, which is not without flattering the eyes of spectators, lies in its title, which each one of us can appropriate. For there are those who will see a fawning reverence to the leader of image processing software, while others will detect a criticism of the art market! The piece by the French artist Jean-Benoît Lallemant also defines itself by its title: US Drone Strikes, Yemen. 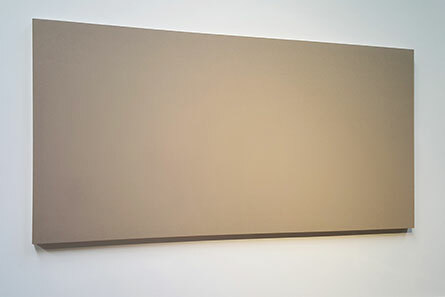 And this is fortunate because the canvas on its large-format frame is unbleached, like in a painter's studio, pending whatever brush strokes it might receive. But nothing happens, other than some micro movements on its surface, which are as stealthy as the drone strikes in delocalized wars. For that is what this is about. The mechanisms behind the canvas reproduce the appalling here and there, oh so stealthily. So there is a map of a territory under the surface of the support. Of the mechanisms of these ‘surgical’ strikes - to use a term that originated with the first Gulf War - we know nothing. The military, about which we know so little, are also particularly fond of technologies ranging from simulation to control through localization. It is these same technologies that, thereafter, interest artists of their time so that wars, among other battles, punctuate the history of art. But how to represent them in this era of great fear of the invisible, if not through technologies that symbolize them perfectly. There is a small work by Pe Lang at the Arsenal in this BIAN 2016, (Positioning systems VI - Falling Objects) that the hurried visitor could miss, especially as it is unmoving, despite the appearance of its mechanisms. Because it is only activated once or twice a day, the time to perfectly align drops of water on a support whose texture is hydrophobic, which is to say that repels water. The drops form tiny spheres that are waiting for the evaporation that occurs, on average, over half a day. So this is the work of a process in which there is nothing left and that only scientific photography would be able to record. It's an all-in-one, inducing the machine, the programme, a material and its support. The artist creates the situation of a performance that takes place without him. The automaton has no other need other than to be supplied with water and electricity to perform, if not time. Of an elastic time that stretches under the terms of its demonstration. This same robot appears as extirpated from the industrial world where its kind are at work. Decontextualized, here it only expresses the emptiness of its task, which time slowly effaces. In the evening, Elektra festival performances follow one upon the other. Starting with one entitled, To Stab by Nelmarie du Preez who was inspired by Marina Abramovic, whose performances are known, alone or with Ulay. 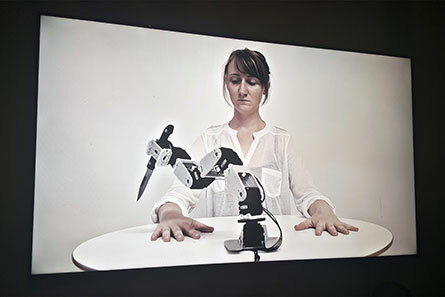 But it is a machine, a robot arm, armed with a knife that she confronts. She rests her hands on the table, spreads her fingers and the public already imagines the result. In the historical performance Rest Energy, Marina Abramovic confides in Ulay when he stretches a bow which holds his arrow. Hence the dramatic tension of the scene. When the South African artist reactivates that same performance, it is again a machine, another robotic arm to which she offers herself. After more than thirty years, it is still about trust. And we can easily project ourselves into this situation as we place our confidence every day in systems and devices of which we know so little. Her performance, To Rely symbolizes perfectly Alain Thibaut’s idea who for sixteen years of the Elektra festival, has relied on the coefficient of art - a concept borrowed from Marcel Duchamp – of digital media. Written by Dominique Moulon for Art Press and translated by Geoffrey Finch, June 2016.